Ruth Dorfman is a longtime member of Equality. She's been a champion for LGBT families in Naples and has worked for years on the coalition working to pass a non-discrimination ordinance in Collier County. This is a chilling reminder that the rise in hate speech across the country in recent weeks and months has very real and very dangerous consequences. When East Naples resident Ruth Dorfman went outside today to pick up her morning paper, what she saw shook her to the core. 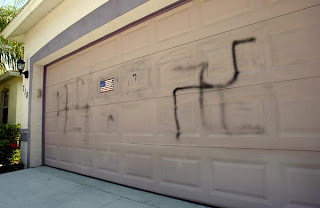 “I saw these swastikas on my garage and I screamed... I remember that,” said Dorfman, 64, who is both Jewish and a vocal member of the Naples chapter of Parents, Families and Friends of Lesbians and Gays (PFLAG). In addition to the two swastikas painted on her garage, copies of an article she had written about the recent Interfaith Convocation Celebration hosted by PFLAG were pasted on the door. Dorfman submitted a story that was published in the Daily News about the second annual PFLAG Interfaith Convocation recently held at Unity of Naples Church. She remembered listening to herself scream when seeing the swastikas and wondering who was screaming. Naples Mayor Bill Barnett, who welcomed the congregation at the most recent PFLAG gathering, was disappointed to hear today’s news. “It’s very sad to me to have someone that narrow minded to do something like that. I’d be sorry no matter who it was.” Barnett said. Collier County deputies are investigating the incident. For more information visit www.naplesnews.com.